Just 3 kilometres away from CST railway station is this well-known bay called Marine Drive that connects to Girgaum Chowpatty. Till now it has been well-known as a major attraction for tourists from India as well as outside the country. The main reason for people to visit Marine Drive is to spend a quality time with loved ones, getting a glimpse of the celebrities such as Shahrukh Khan, grasping the nature’s beauty like watching the beautiful sunset and so on. But on 1st June, 2014. Sunday. It also became a very successful day for few photographers as they choose Marine Drive and Girgaum Chowpatty to showcase the best they could do by clicking. And the results were such that would keep your jaws hanging as you see the photographs that were snapped. For these few people, Their Loved One Is Their Camera, Watching Sunset Is Through A Lens With Different Exposures’ And Off Course The Celebrity For The Day Was That Adorable Cat. And the day was spent well. 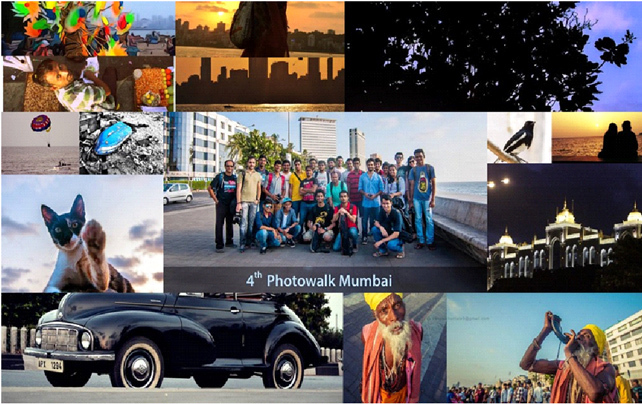 Thanks to the organizers of the photo walk- Sanket Khuntale, Prashant Parab, Silver Stalin, Shikhar Sharma that gave a reason for a street view photography.